Im going to attempt a live report, updating when Im able to. 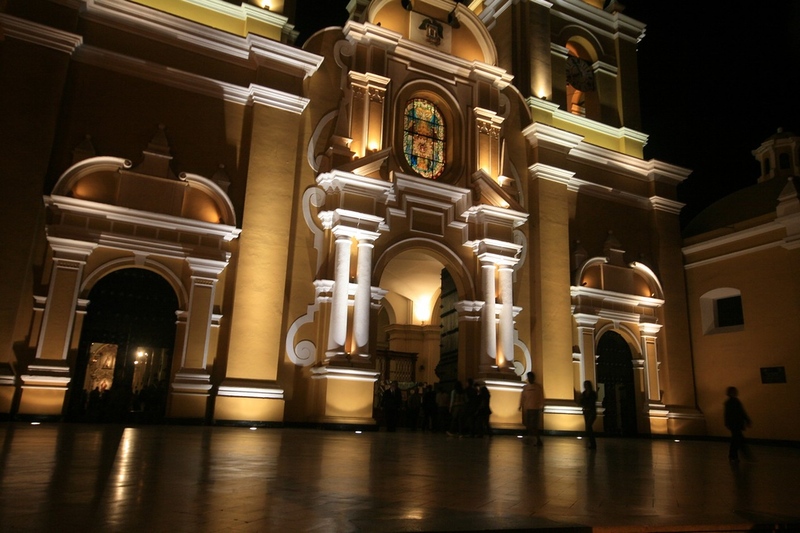 My wife D and I are in Trujillo after our first day. Yesterday I was still trying to convince my boss I needed to take our bikes out the country, and would he now finally let us go? He had postponed my leave once already - No reason really, just being spiteful. 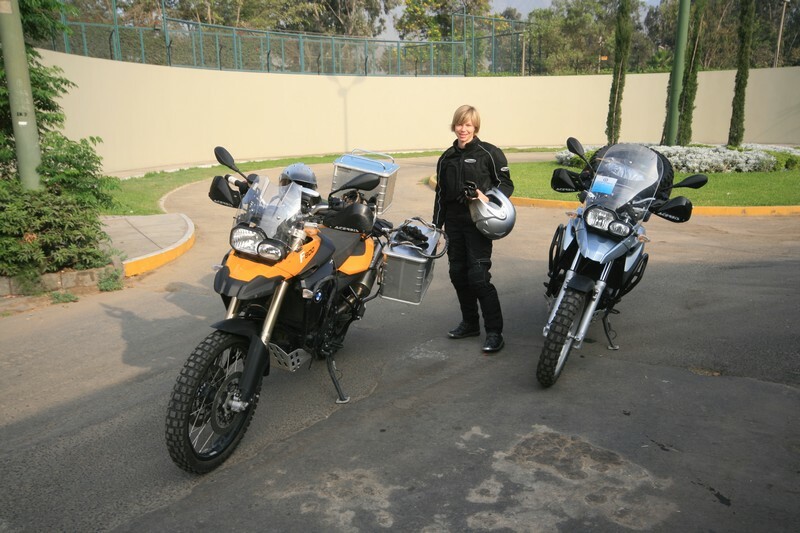 Given the current market conditions, perhaps I should just shove the job and we could tour the whole of S America. Been giving it some thought. Pics wil be uploaded after dinner, we are famished! We spent most of the week getting things getting ready, but you know how it is, last night we were up late packing and fiddling to be ready on time. 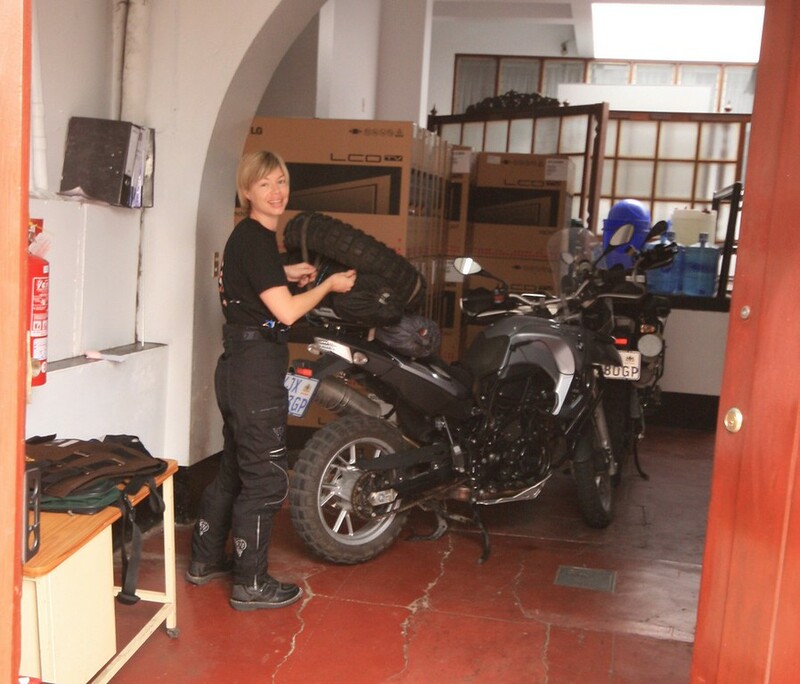 I found out that the catch on one of my side panniers was smashed off from the fall (See Drama in the Andes), so it was secured using tie downs. It would have to do. We want to camp a couple of nights if we find a place we like, so all that clobber had to go in too. Too much stuff, I thought. Anyway we got it all in. 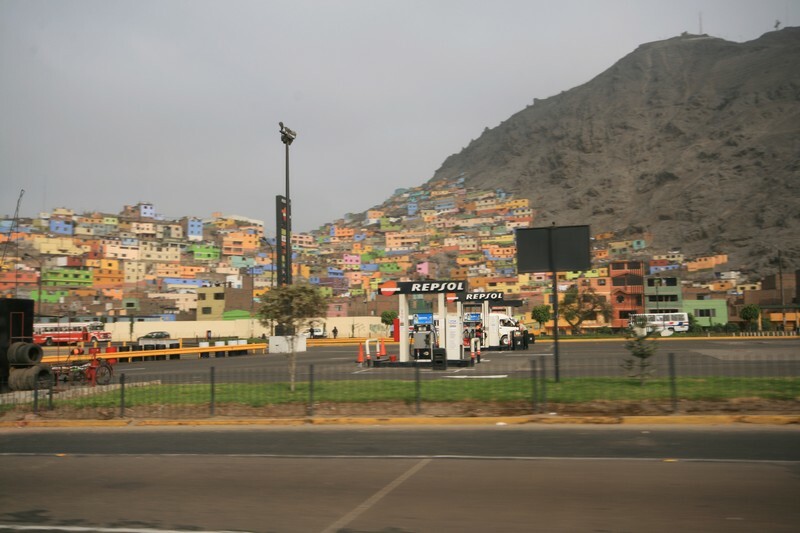 Riding out of Lima at eight on Sunday morning, The sun was out this time, and the colours in this poorer area really came out. It took us the better part of an hour to beat the traffic out to the north. It felt good to be on the open road. We were under the impression that it was a boring monotonous drive to the border. 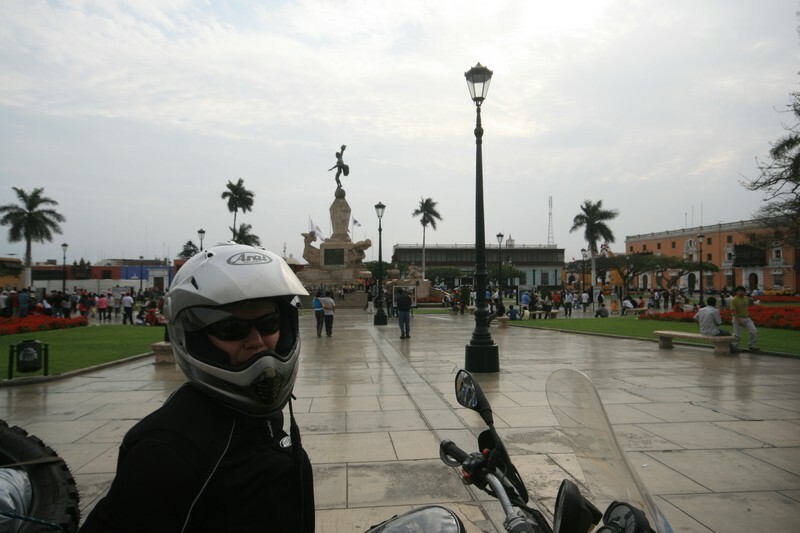 While the Pan American highway is not dirt there are plenty of interesting things so see on the way. Here is an Inca ruin, they are strung along the coast in the desert at every river interesction, like a line of British forts in the Boer war. 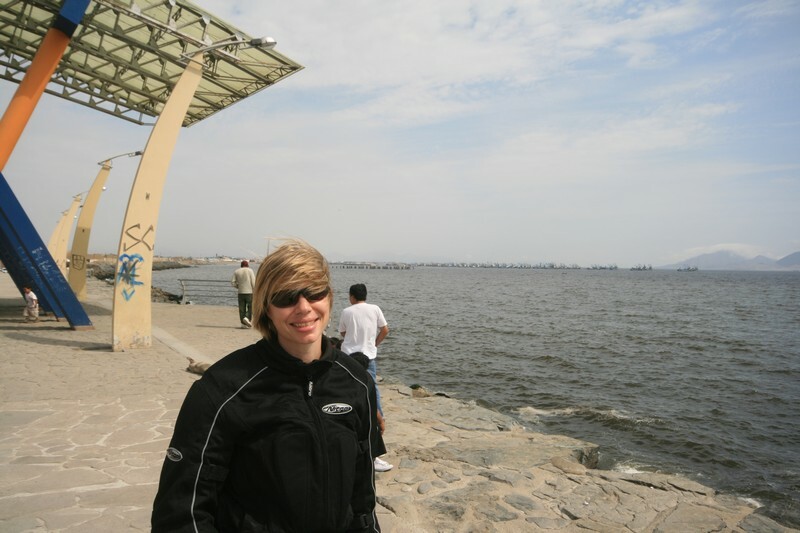 We stopped in the fishing town of Chimbote. Thousands of small fishing boats bristle on the water. The locals have some interesting public art. This was at the main roundabout out of the city. The crosswind in the afternoon was really something. You end up leaning over at a crazy angle, and every time a truck goes past you really have to battle holding it as you get sucked into the oncoming traffic. D did amazingly well, I was so proud of her. On the one corner it was surreal, the corner went right but with the strong wind coming in from the left we were leaning the wrong way...I wanted to get a pic, but the buffeting was too much. Still, the scenery detracted from the challenge. 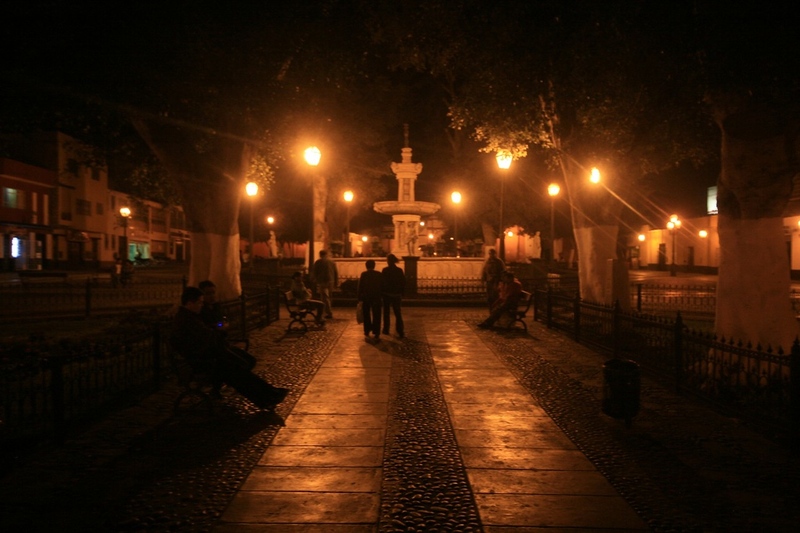 When we ge\ot to Trujillo at 4:40 pm we were tired but quite pleased. I'll post some more on the city next time. Come on, bring some more, cannot wait any longer as Puddles and I also need to go on a trip and then we will have to read it in January (this is next year). Yes, why are you overloading D's bike??? Ok this is going to be good, all the best on the trip and ride safe. Looking forward to your up-dates. Can't wait anymore, now I'll have to wait till next year!! 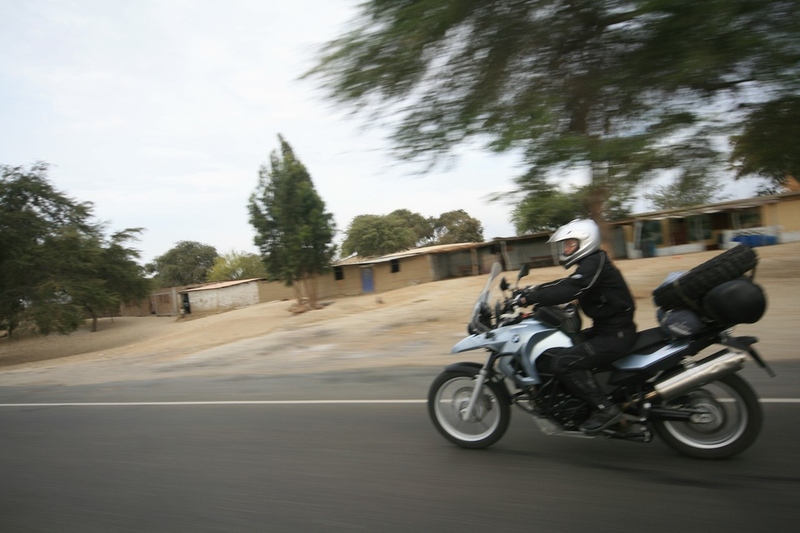 Hi Bluebull,that first pic of D looks like it could be SA.Are you allowed to ride there with SA plates? and tell me what type of work do you do living over there. Well its called love .... Hard to find a good wife these days...she refuses to carry beer for me but does carry my tyre!! ..
More on that tyre later!! For the rest of us who are..."ja swaer, ja"
YouÂ´ll see quite few places we visted here on this trip look like SA, sometimes I catch myself looking around for kudu and other bokkies, but believe me, its not. Yeah we kept our SA plates because we are proud of South Africa. Not sure if we are allowed to per se, but the bikes are legally here, no cops seems to have a problem with it, and there plenty bikes around that have no plates anyway!! Cops dont even check plates here, all they want is to see your licence and then hopefully get R30 (10 Soles) off you. Oh, Im a mining engineer which really is just an excuse to play with massive trucks, break things and when that gets boring, blow stuff up using hundreds of tons of explosives. The main hotel in Trujillo is quite a splendid spanish building. Trujillo (pronounced Tru-gee-yo) is known as the â? ?city of the eternal springâ?� with a climate similar to Swakopmund in Namibia, only with a consistent temperate of 23 degrees. ItÂ´s on the coast, and a heavy mist hangs over the city, yet high enough so as not to make everything too damp or cold. 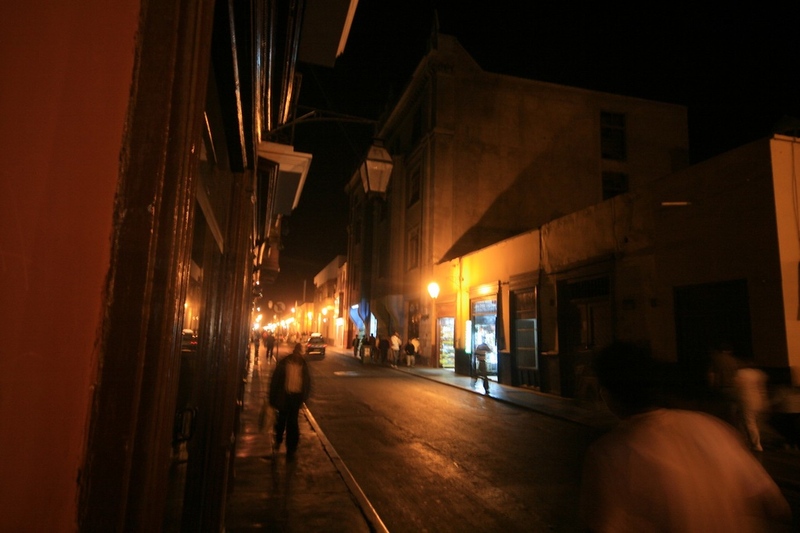 The lamps in the street are the original lamps used by the Spanish in the early days, and many of the buildings date from the 1500Â´s too. 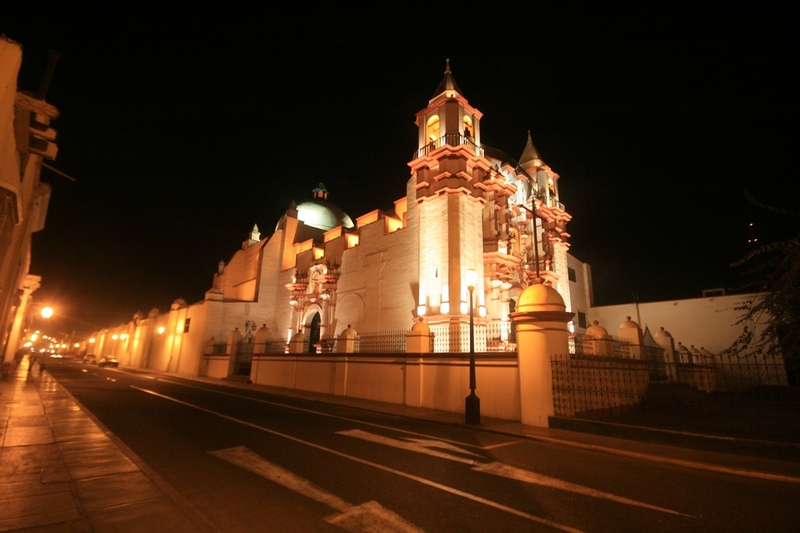 Trujillo was one of the first cities founded by Spanish conquerors in America in 1534, under the name of "Villa Trujillo," in honour of Francisco Pizarro's birthplace, Trujillo in Extremadura, Spain. On 23 November 1537, King Charles I of Spain gave it the rank of 'city' and the coat of arms that remains a symbol for the city. 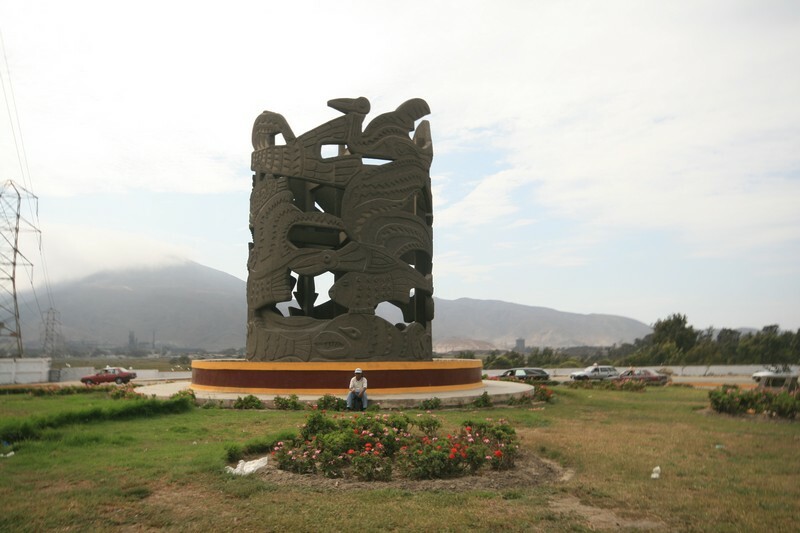 It was founded among four ethnic Chimu settlements (Huanchaco, HuamÃ¡n, Moche & Mampuesto), so the spanish could rally up support to conquer the dominant the Incas up in the mountains. These guys formed the main army supporting the 160 odd conquistadores defending occupied lowlands. In 1619, an earthquake destroyed the city. Years later, in 1624, a new period surge started with the rebuildings of palaces and the opening of the seminary and the school of the Jesuits. 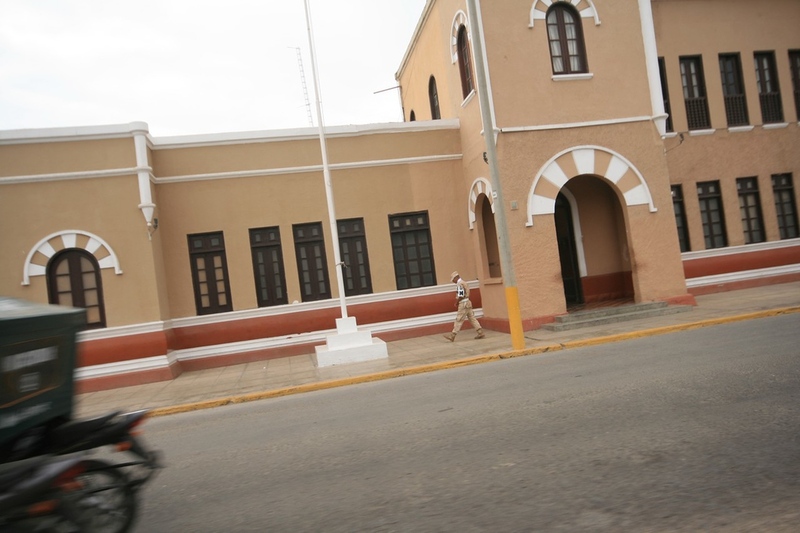 The city played a significant role in the struggle against a complete Spanish rule. 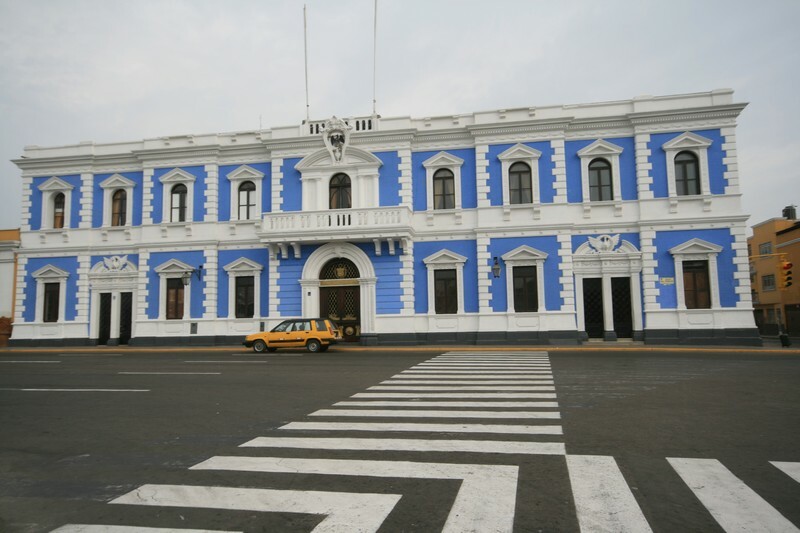 It was the first important city of Peru that proclaimed its independence of Spain on 1820, serving as temporary capital of Peru in 1825, and was the main headquarters for Simon BolÃ­var. I must say, I found myself pretty tense wandering around this city on foot at night with a camera and my beautiful wife, but after a while I realised that actually no one was really out to get us. I think itâ? ?s a reflection of our crazy culture back home, you know, to always be on your guard. We arrived at this park and people were relaxing with their kids there. We made our way about 6 blocks up the road and came across another park, people relaxing on benches and stuff. Just before the restaurant we passed the convent, which still keeps itÂ´s patrons well protected from the public with a 5m perimeter wall, seen behind this church. 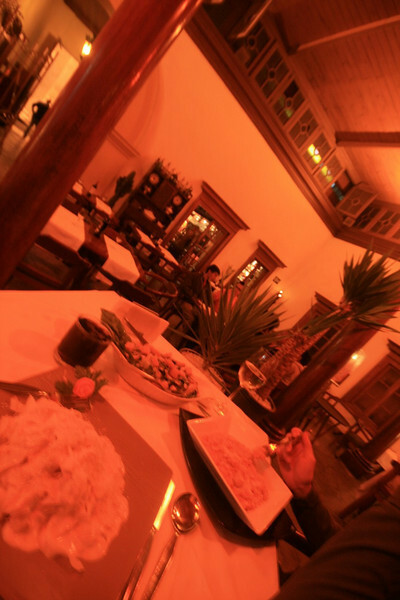 The restaurant was awesome, set in this old Spanish house built in a quadrangle with the central square roofed in. The food was excellent and relatively cheap. The next day D sets up her bike for the next stage of our journey north. We had managed to sneak our bikes into the back entrance of the hotel to rest for the night with a whole bunch of flat screens that were due to be installed in the rooms. 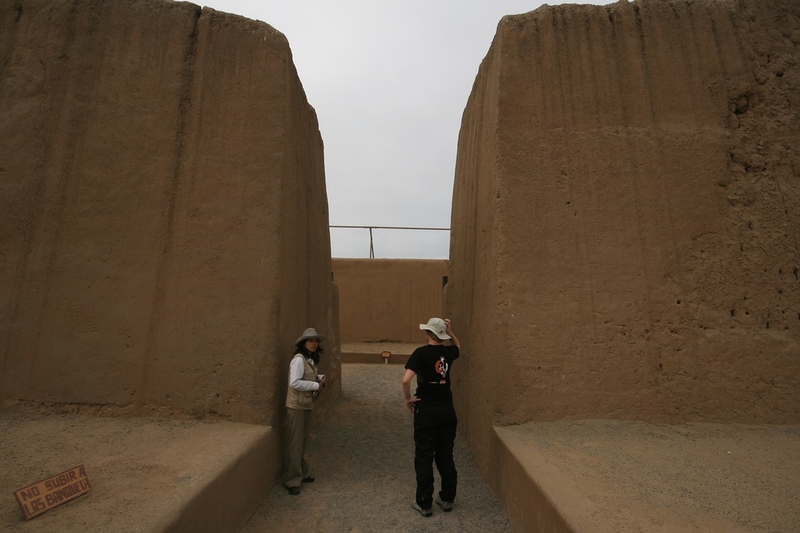 Before we left we when to see where these Chimu people lived. 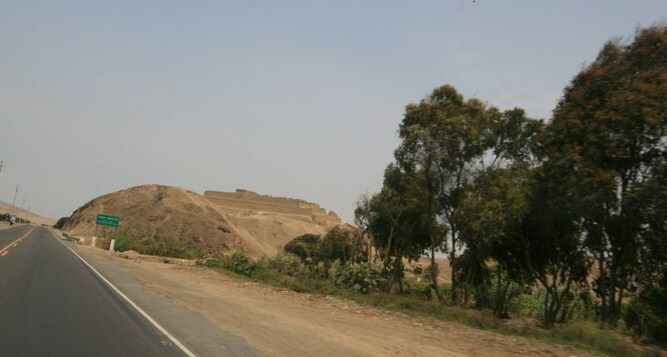 Towards the airport we came across this huge undeveloped area of desert in the city filled with ruined palaces. Active archealogical excavations continue to this day. This team of guys admired our bikes as we arrived before they pushed off. 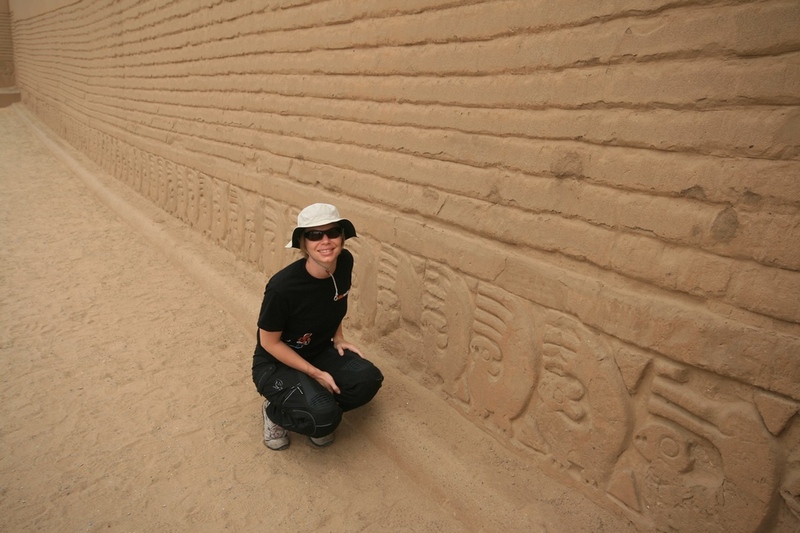 There are 18 walled cities in this area measuring on average 1km x 1km, only one of which has been excavated so far, and this one is not yet complete. They have murals of seals as well as pelicans, and fish in their walls all over the place. This wall was part of the main auditorium, which although was over one hactare in area, had awesome acoustics. This area reminded me of the ZIM ruins (no pun intended). 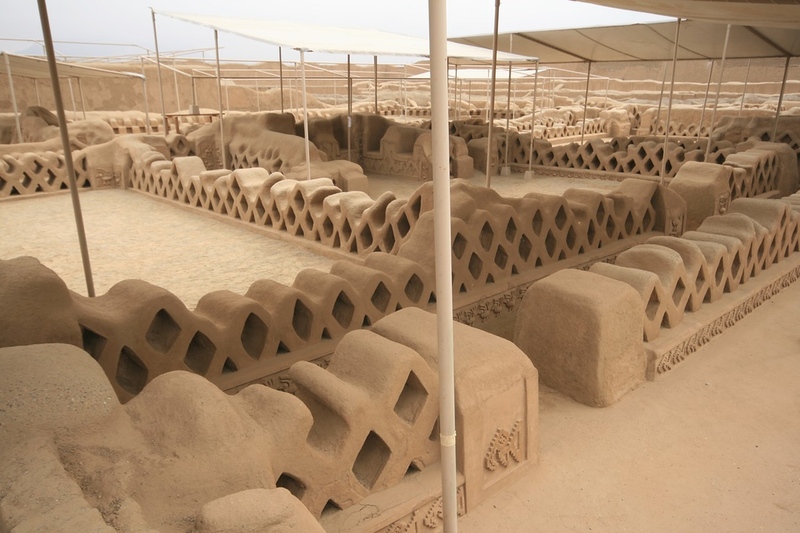 Everything is made from mud bricks, which is not a problem in the desert, apart from the odd shower every 80-100yrs. They dug these large wells to obtain fresh water, obviously there is some kind of subterranean flow around 6m below the surface of the desert. 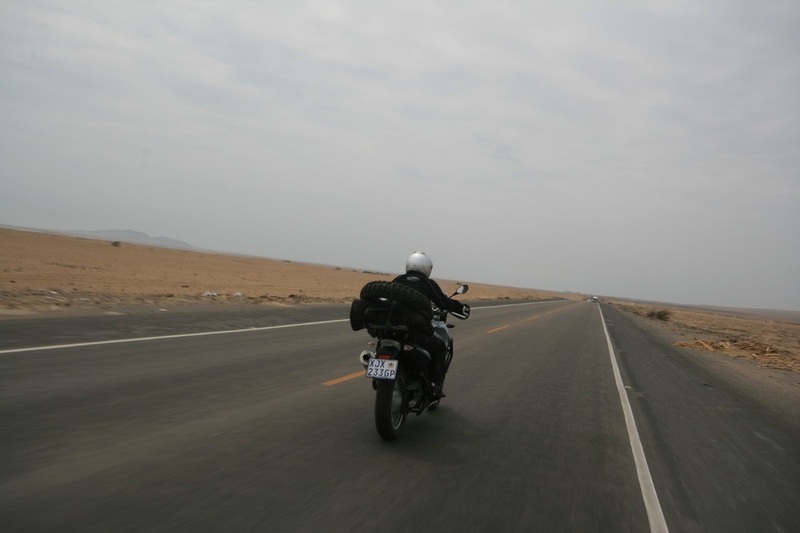 Having satisfied DÂ´s curiosity I was itching to get on the road again, and belted off up north along the Carretera Pan American. 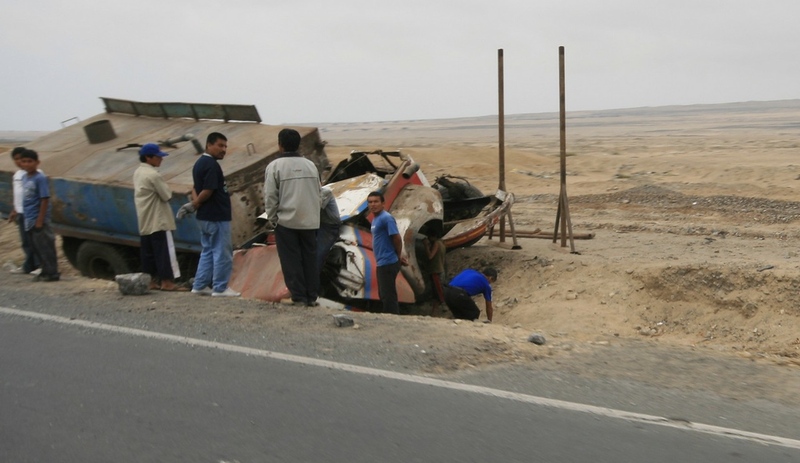 Five minutes later we came across two trucks involved in a head-on collision. Definitely fatalities there. 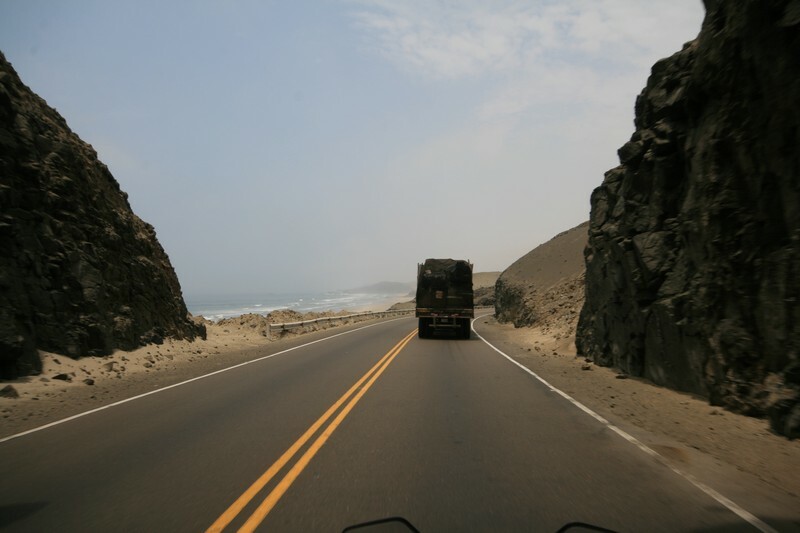 Got to watch these Peruvian drivers ALL the time when riding in this country. Back out into the desert for mile after mile. Fun to open up and fly. 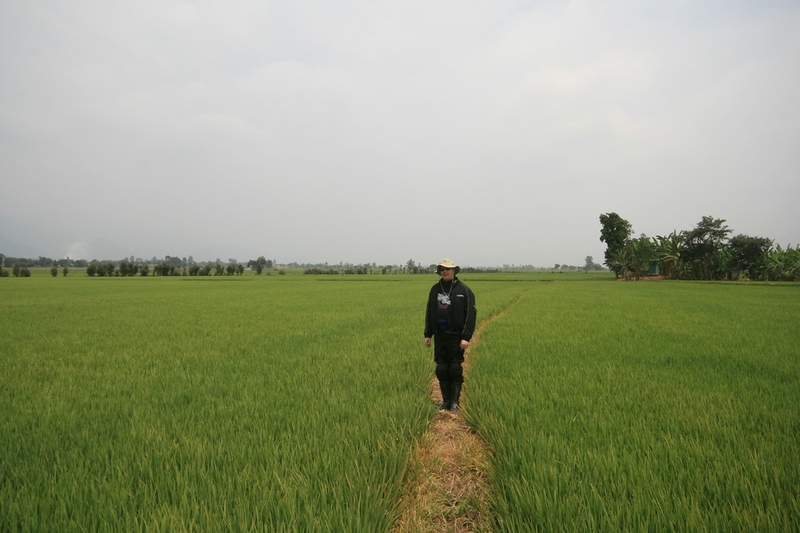 But when the rivers from the mountains cross the desert to the Pacific ocean, even here there is life - Rice paddies. In one of the driest parts of the planet, we have perhaps the most water intensive farming imaginable. There is one thing Peru has plenty of, and that is water. 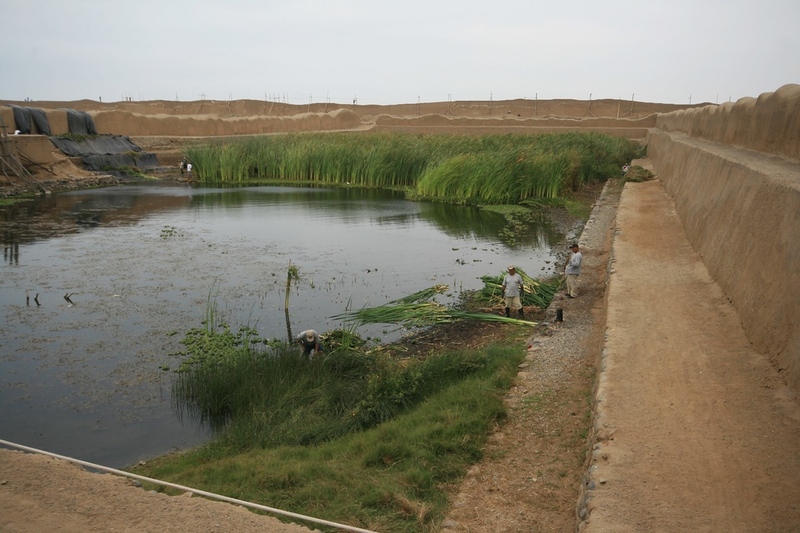 Only 1.5% percent of the rainfall that falls in Peru runs from the Andes into the Pacific ocean and generates all of PeruÂ´s power and supplying all itÂ´s water needs. The rest flows into the Amazon river and ultimately reaches the Atlantic Ocean on the other side of the continent. Our bikes resting (on their feet). Onward, and as the afternoon wore on, the cross wind picked up. Challenging taking photos one-handed in this lot at 160! 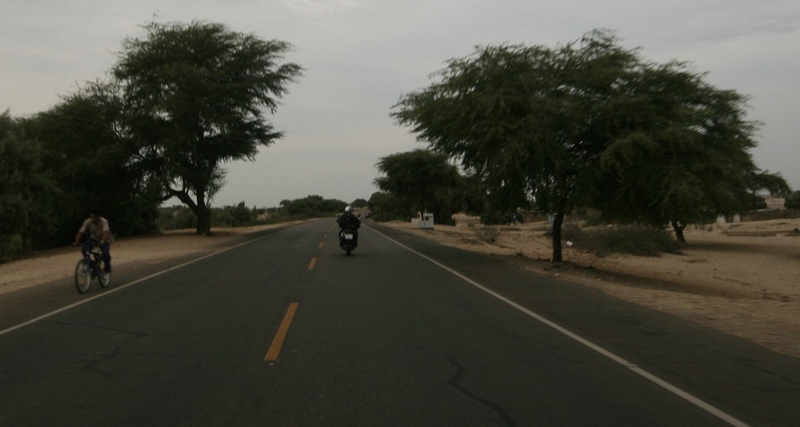 Driving through Chiclayo was awful. I wasnâ? ?t able to take photos thanks to the numerous three-wheeled little moto-taxis trying to cut us off at every opportunity. Avoiding them, the smoke-belching trucks, busses with offset axles, drunk pedestrians and about 50 million dogs made riding, never mind photography particularly hazardous. It would have been bearable if the people there were not rude and obnoxious. Awful. 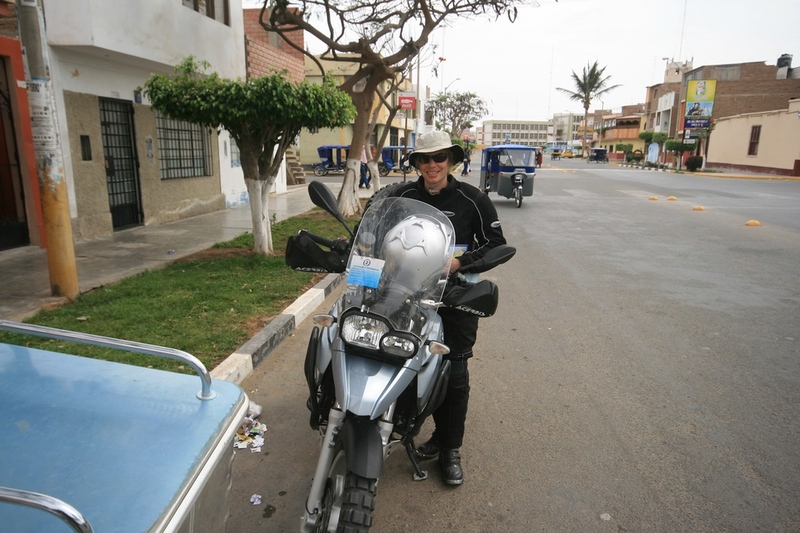 So we stopped for a late lunch at a place about 30km further on called Lambayeque. Our lunches were pretty simple: Tuna and tomato sandwiches with water. A lot less risque than the local dodgey resturants, and therefore less opportunity for trots in the desert - Never a nice contemplation. 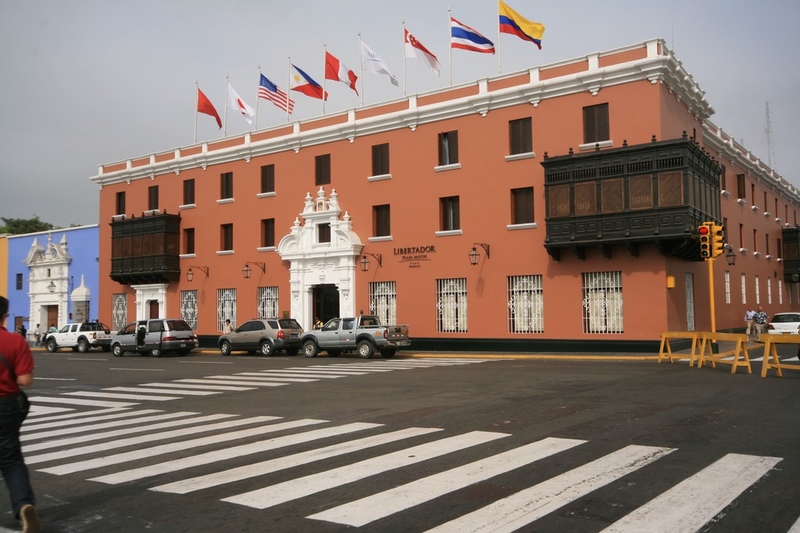 In Lambayeque, they had this cool looking MP barracks, the boys up here wear the desert uniforms reminding me of Algerian legionaires of all things. 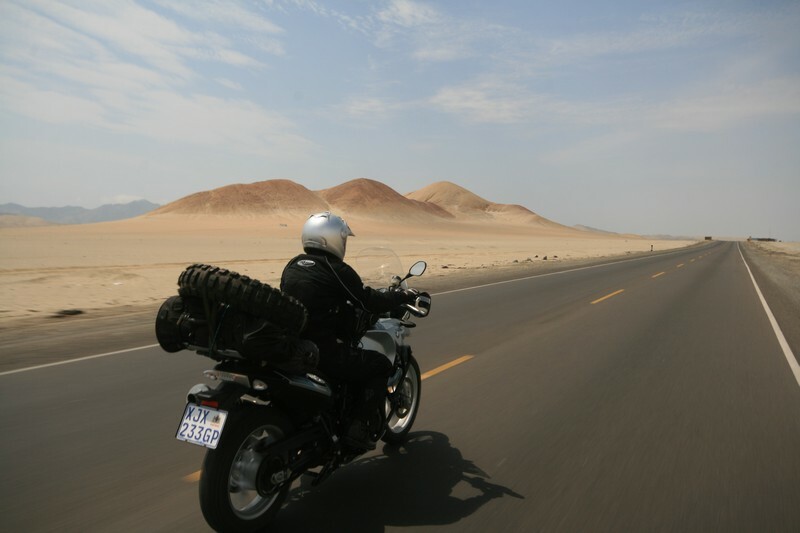 Our aim was to get to Piura, about 260km further to the north. This would leave us with just a few hundred km for the following day to the border. The temperature climbed as we went north, and the desert gradually turned to bushveld. 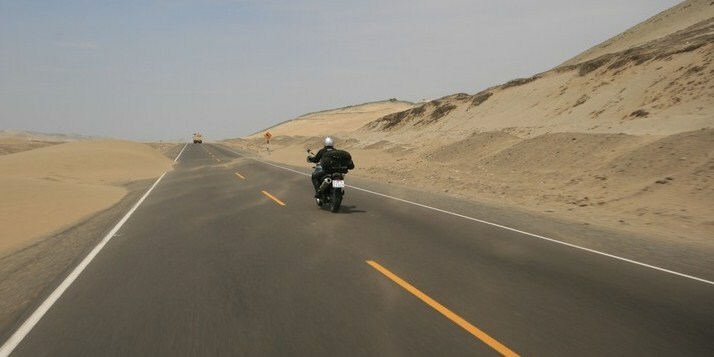 On the way to Hammanskraal Piura. My eyelids are drooping now so IÂ´ll continue tomorrow. Ride safe out there! Kies vir jou een maar hier moet ons deur. As die hoender in jou vasvlieg moet sy vere waai, maar dis darm ook nou nie nodig om in die hoenderhok in te klim nie. Damn this is a cool report, can't wait for more. The long wait is over!!!!!! Nice informative report, it must have been an awesome trip. Keep it coming. Waiting to hear about tyre? Looks like it could be viable to come and put up a paint shop over there? The people donâ? ?t seem that perky though.